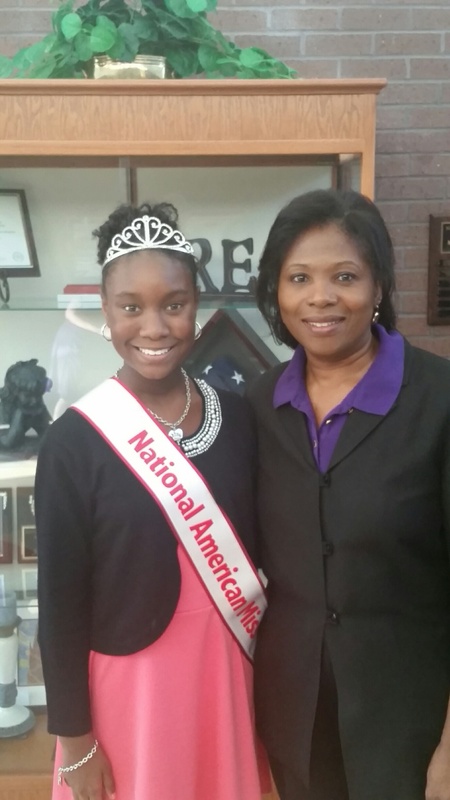 2014-2015 National All-American Miss Jr. Teen Madeline Monlux speaks to her local news station. Author Matt LevertonPosted on January 9, 2016 Categories Community Service, Former Queen, Jr.Teen, National Queen, Pageant Stories, pictures, Press Release, RoyaltyTags all, american, jr, local, madeline, monlux, nam, namiss, national, news, pageant, pageants, queen, speaks, station, teen, toLeave a comment on 2014-2015 National All-American Miss Jr. Teen Madeline Monlux speaks to her local news station. Miss Tennessee Princess Ava Lowe donates supplies to local Health Department. 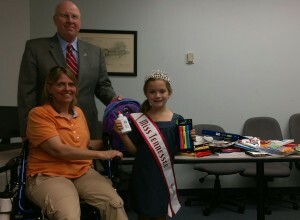 Miss Tennessee Princess Ava Lowe donates supplies to local Health Department. Ava donated school supplies that were donated at the Tennessee State pageant to Robertson County Mayor Howard Bradley and Kelley Harris with the Robertson County Health Department. The supplies were for Mayor Bradley’s 8th annual Back to School Bash where students can get free school supplies as well as free checkups and sports physicals. 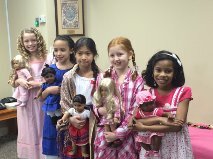 Author Matt LevertonPosted on November 29, 2015 Categories Community Service, pictures, Princesss, Royalty, tennesseeTags ava, back, bash, Department, donates, for, Health, lowe, nam, namiss, pageant, pageants, princess, school, supplies, tennessee, toLeave a comment on Miss Tennessee Princess Ava Lowe donates supplies to local Health Department. 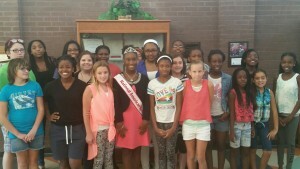 Miss Georgia Pre-Teen Spokesmodel Damacia Howard was a guest speaker for the middle school girls of “Destiny’s Daughters of Promise” Barber Middle School chapter. 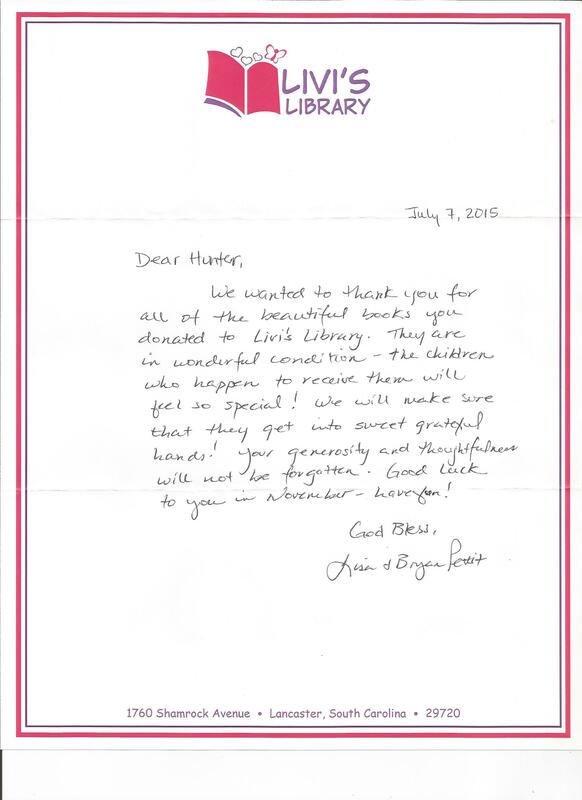 She encouraged, inspired and invited them to join her in her community project, “Books for Africa”. Damacia met with the girls from Barber Middle School, the Director of Destiny’s Daughters of Promise Lorraine Thomas and Dr. Barbara Swinney Assistant Superintendent Elementary School Leadership & Learning Cobb County Schools. 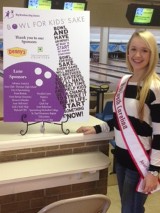 Madisyn Earls, 2015 Georgia Jr. Teen Cover Girl, donated supplies to Ingram-Pye Elementary School. the staff is planning a year filled with success for their students! 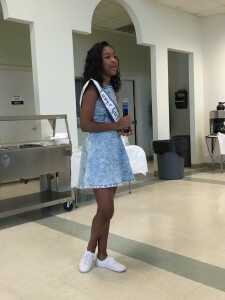 Author Matt LevertonPosted on October 18, 2015 March 20, 2016 Categories Community Service, Cover Girl, Georgia, Jr.Teen, pictures, RoyaltyTags cover, donates, earls, elementary, Georgia, girl, Ingram-Pye, jr, madisyn, nam, namiss, pageant, pageants, school, supplies, teen, toLeave a comment on Madisyn Earls, 2015 Georgia Jr. 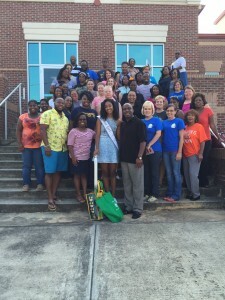 Teen Cover Girl, donated supplies to Ingram-Pye Elementary School. 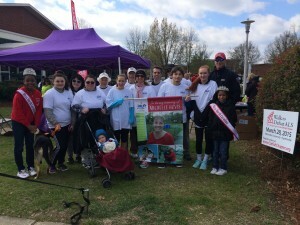 North Carolina Jr. Pre-Teen and Pre-Teen walk to defeat ALS. 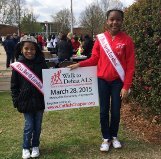 North Carolina Jr. Pre-Teen, Amaris Shipman and North Carolina Pre-Teen, Nikya Hightower participated in a walk to defeat ALS in Fayetteville, NC. The walk was done to bring hope to people living with ALS, to raise money for a cure, and to come together for something they care about. 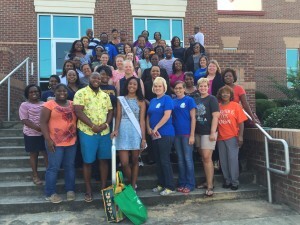 Author Matt LevertonPosted on June 23, 2015 March 30, 2016 Categories Community Service, Jr. Pre-Teen, north carolina, pictures, Pre-Teen, RoyaltyTags ALS, carolina, defeat, jr, nam, namiss, north, pageant, pageants, pre, queen, teen, to, walkLeave a comment on North Carolina Jr. Pre-Teen and Pre-Teen walk to defeat ALS. 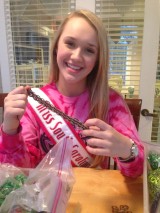 Hannah Jacks, Miss South Carolina Jr. Teen Queen, says farewell to her year of service! Congratulations, and welcome to the Miss South Carolina Pageant! I am truly looking forward to meeting each and every one of you. This weekend is going to be very exciting and an adventure you will always remember! 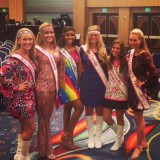 Being Miss SC Jr. Teen has been such a blessing to me. It allowed me the opportunity to volunteer at the Ronald McDonald House Charities, making pop tab bracelets, which helped to raise money for the organization. I also volunteered for Big Brothers Big Sisters at their Bowl for Kid’s Sake and helped at the spring 2015 Special Olympics. All the while, meeting some amazing people along the way! Going to Nationals in California is an experience I will never forget! From competing with the best of the best to touring the streets of Hollywood, my time at Nationals is something I will treasure forever! I can honestly say I have made friendships that will last a lifetime. Remember to always smile, have fun, and make as many new friends as you can. Above all else, believe in yourself. You are already a winner! As my journey comes to an end and a new one begins for one of you special girls, I wish you all the best life can bring! 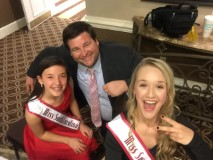 Author Matt LevertonPosted on June 14, 2015 Categories farewell, Jr.Teen, pictures, Royalty, south carolinaTags carolina, farewell, hannah, jacks, jr, nam, namiss, of, pageant, pageants, queen, says, service, south, teen, to, YearLeave a comment on Hannah Jacks, Miss South Carolina Jr. Teen Queen, says farewell to her year of service! Amaris Shipman, Miss North Carolina Jr. Pre-Teen, modeled to benefit Child Abuse Prevention and Intervention Programs. 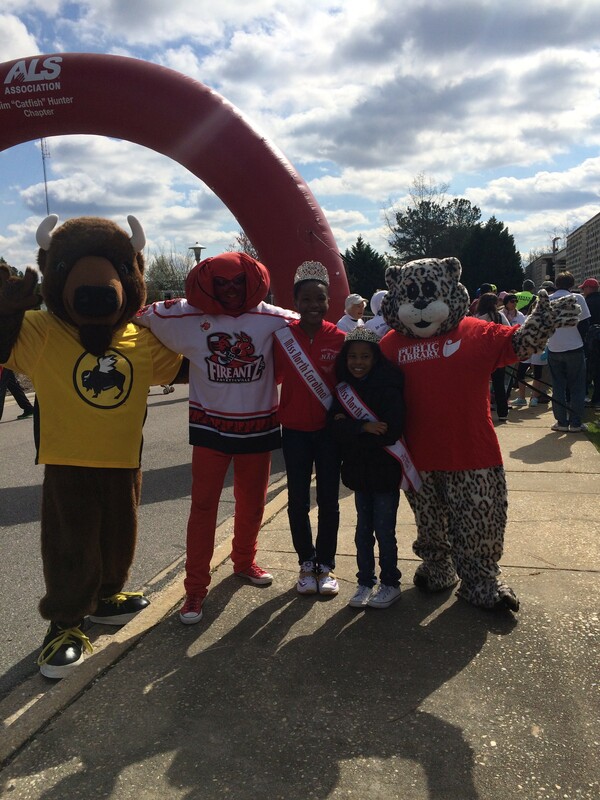 Miss North Carolina Jr. Pre-Teen, Amaris Shipman, was featured in Up & Coming Weekly as a model for the “American Girl Fashion Show” hosted by the Child Advocacy Center of Fayetteville, NC. The show is being held to benefit Child Abuse Prevention & Intervention Programs. This is Amaris 2nd time being selected to participate and volunteer her time to support the efforts of the Child Advocacy Center. National American Miss makes positive impacts on communities. Here are the pages from the Up & Coming Weekly! Author Matt LevertonPosted on May 16, 2015 March 30, 2016 Categories Community Service, Jr. Pre-Teen, north carolina, pictures, RoyaltyTags abuse, amaris, and intervention, benefit, carolina, child, jr, modeled, nam, namiss, north, pageant, pageants, pre, prevention, programs, queen, shipman, teen, toLeave a comment on Amaris Shipman, Miss North Carolina Jr. Pre-Teen, modeled to benefit Child Abuse Prevention and Intervention Programs. 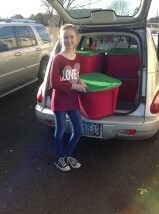 Oregon Jr. Pre-Teen Queen Jeanneil Rogerson shared the Christmas spirit with some deserving folks! National American Miss Oregon Jr. Pre-Teen Queen, Jeanneil Rogerson, shared the Christmas spirit with some deserving folks. Jeanneil delivered 13 food boxes to St. Francis Shelter. St. Francis’s Shelter helps the homeless and people living on a limited income. Jeanneil used the money she won at Nationals to purchase all of the items and was happy to be able to fill all of the boxes with money she has earned! Author Matt LevertonPosted on February 21, 2015 Categories Community Service, Jr. Pre-Teen, National Pageant, oregon, pictures, RoyaltyTags boxes, delivered, food, francis, jeanneil, jr, nam, namiss, oregon, pageant, pageants, pre, queen, rogerson, shelter, st., teen, toLeave a comment on Oregon Jr. Pre-Teen Queen Jeanneil Rogerson shared the Christmas spirit with some deserving folks! North Carolina Jr. 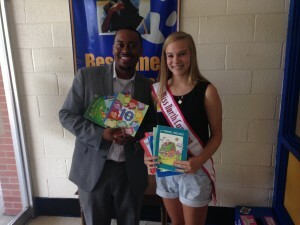 Teen Queen Meredith Twigg donated books to local elementary school and church. 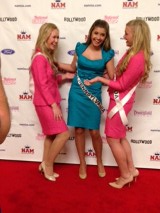 Meredith Twigg, National American Miss North Carolina Jr. 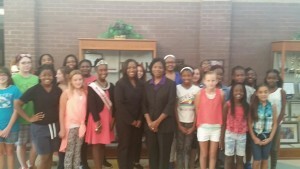 Teen Queen donated the books from the pageant to the principal of Bessemer Elementary School in Greensboro. Bessemer Elementary School and First Baptist Church Greensboro hosted a “Steps to Success” Kindergarten camp for children. The camp aims to equip these new kindergarteners, some of which do not speak any English, with the necessary skills and confidence needed to start school. Meredith is volunteering this week as a “Buddy” for the children and travels through a mock school day each day. Breakfast and lunch is provided by the church. 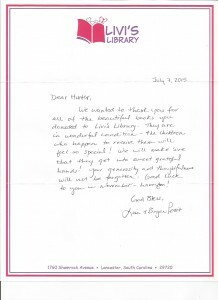 Meredith donated all the books to the school to be used as take home books for these children to have. Some of these children live in the Children’s Home and others do not have books at home. Students will get take home “homework” bags with these books in them. Author Matt LevertonPosted on December 6, 2014 Categories Community Service, Jr.Teen, north carolina, pictures, RoyaltyTags and steps, and volunteered, bessemer, books, carolina, donated, elementary, jr, meredith, nam, namiss, north, pageant, pageants, queen, school, success, teen, time, to, twigg, withLeave a comment on North Carolina Jr. 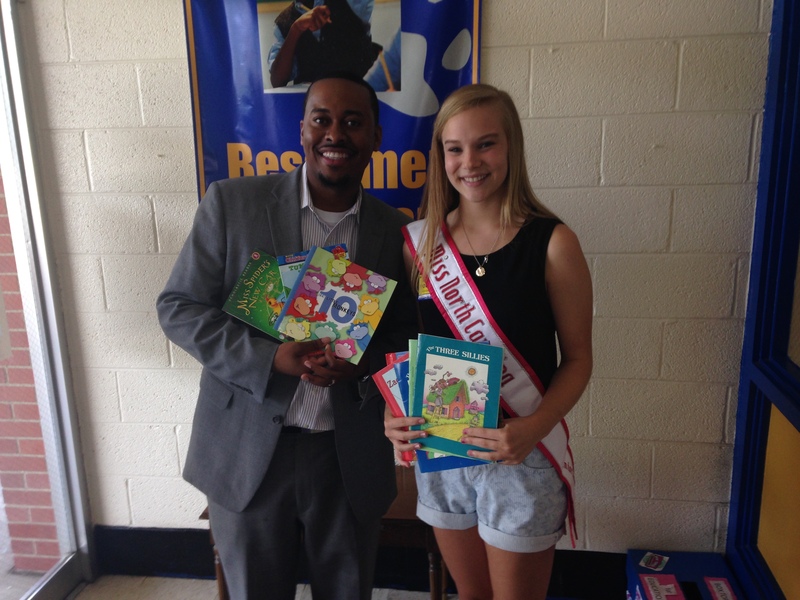 Teen Queen Meredith Twigg donated books to local elementary school and church.